Do you want to start running, but don’t want to do it alone? 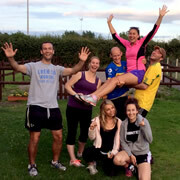 Wincanton Sports Ground is starting a beginners running group using our 3-2-1km route. Participants can walk, jog or run the route, doing what make them feels comfortable. Back in March, Wincanton Sports Ground was fortunate enough to receive funding from the Somerset FA to set up football sessions for adults with disabilities. With the winter months approaching, unfortunately the sessions have now finished for the year. 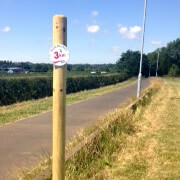 Wincanton Sports Ground has recently created a 3-2-1 km run route around its grounds. The 3-2-1km run, which is a Run England project, allows you to track and measure your run, jog or walk when it best suits you. Wincanton Rounders League Comes to a Tense Close! Wednesday 16th July saw the final week of Wincanton’s first ever social rounders league, and what a league it was! The previous seven weeks saw five teams battling it out to be crowned champions of the 2014 season. 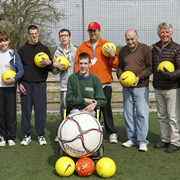 Giving everybody the opportunity to take part in sport is something we are passionate about at Wincanton Sports Ground, so when we received funding to set up a football session for adults with disabilities, we couldn’t wait to get started! With the Summer holidays fast approaching, Arsenal Soccer School has decided to return to Wincanton Sports Ground running sessions throughout the summer break! The sessions start on Wednesday 30th July on the astro, and run every Wednesday until 27th August. 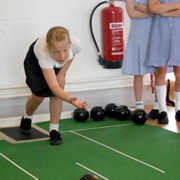 Wincanton Primary School Pupils Give Short Mat Bowls a Go! 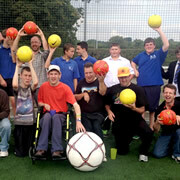 At Wincanton Sports Ground we aim to provide a variety of sports for a variety of people. Most recently we invited pupils from Wincanton Primary School to come down and have an opportunity to try Short Mat Bowls. Wincanton Social Rounders League Gets Started in the Sun! With such beautiful weather recently, the teams entered into the first ever Wincanton Social Rounders League at the Moor Lane Sports Ground couldn’t wait to start their campaign in the sun! Wincanton Sports Ground is excited to announce that we will be holding our annual Open Day on Saturday 14th June 2014 from 12.00pm onwards. We have a range of activities that are perfect for a family afternoon out! Sport 50 is continuing to run at Wincanton Sports Ground. If you are over 50 and would like to take part in activities such as boccia, indoor curling and indoor badminton, while meeting new people, then Sport 50 could be for you! 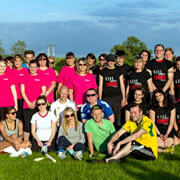 Summer is nearly here, which means rounders season! 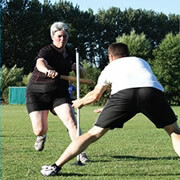 Wincanton Sports Ground is excited to announce that a mixed social rounders league will be starting here every Wednesday from 11th June to 16th July running from 6.30pm to 8.00pm. Wincanton Sports Ground, with Arsenal Soccer School, will be holding a two day Soccer School over the Easter school holidays. This amazing opportunity will be held on Thursday 10th and Friday 11th April. Wincanton Sports Ground has received funding from the Somerset FA to help set up football session for adults with disabilities. The sessions will be run on the astro-turf pitch every Monday from 3rd March. Following previous success, Wincanton Sports Ground is delighted to announce that we are holding another opportunity to be involved with Arsenal Soccer School over the February half term. This will be held from Wednesday 19th to Friday 21st February 2014. New Year, New Start! 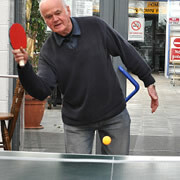 Wincanton Sports Ground is looking to develop the range of sports on offer. We have loads of new activities planned for 2014 so come and be a part of it. 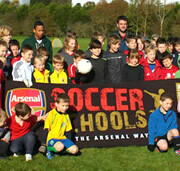 This October, Arsenal Soccer School is coming back to Wincanton Sports Ground. This is an amazing opportunity for children of any ability to be involved in a course led by official Arsenal Soccer School coaches. Friday 2nd November was a landmark day in the life of Wincanton Sports Ground. Arsenal F.C started a relationship with the users of the Maddocks pavilion in the form a Regional Development Centre, which we believe will go from strength to strength. 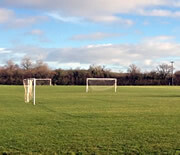 Wincanton Sports Ground is about to play host to several Arsenal FC Soccer Schools training events. This is an amazing opportunity for our young aspiring footballers to learn from the professionals. A fantastic opportunity for young people between 5 and 12 years to enjoy a day with the Arsenal Soccer School at the Wincanton Sports Ground on Friday 2nd November. This is a marvellous opportunity and fantastic value at just £2.50. 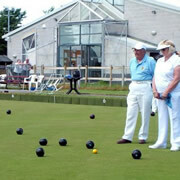 Wincanton Sports Ground welcomes you to their 2012 Open Day at Moor Lane. Try some of the sports offered by the clubs at the Sport Ground for free, enjoy refreshments and talk to representatives from Wincanton Sports Centre and Herbalife.